Pictures of the logo, front, rear and insides of my 386i. The Sun 386i is a difficult machine to find information on. I know this because to produce this page, I went looking. I think that the 386i can be summed up tidily by what you can, or as the case may be - cannot, find on the internet. The 386i was the poor toothless cousin that everyone forgot. Intentionally, I would think. When the intel 80386 processor was becoming mainstream and had finally reached a level of stability and maturity to run SunOS, Sun developed the 386i. With either a 20mHz or 25mHz i80386 with i80387 co-processor, the 386i first ran SunOS 4.0. It lasted two revisions, up to 4.0.2 before it was no longer supported. From what I understand, it was a pretty miserable failure. 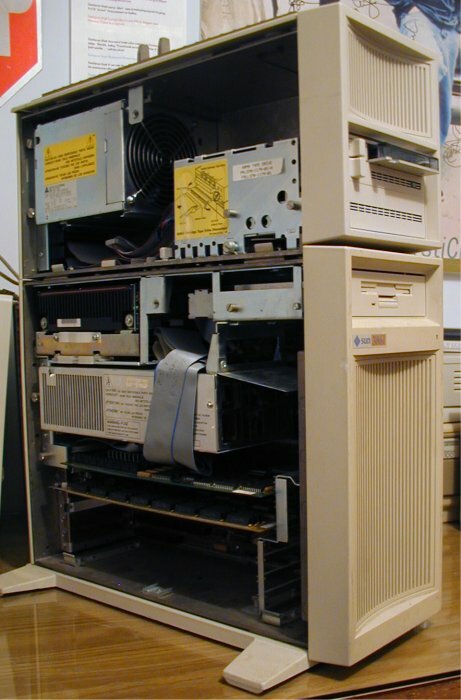 The 386i is in a large-tower configuration, with 4 ISA slots. 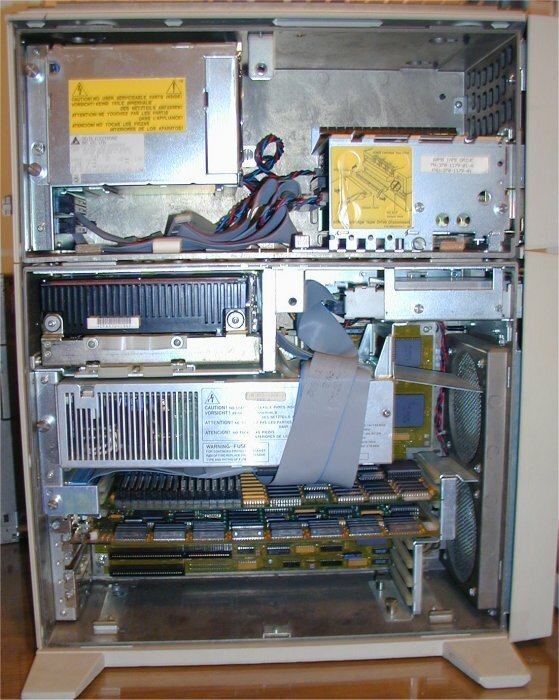 From looking at the insides of mine, you can see its made up of two compartments, an upper drive cabinet, and then the main cabinet with a 3.5" floppy drive and a 5.25" SCSI harddisk. The upper drive cabinet is removeable and as I have seen pictures of both style of cases, I must assume it was a Sun option. Both cabinets have their own power supplies. The two cards in my machine are both in propreitary slots. The upper card is in what appears to be similar to a Processor Direct Slot, and is a memory expansion card. The lower card is a frame buffer with another propreitary interface. This one has a special cable which branches off into two separate cables, one containing the video signals (in 4 coax connectors) and the other to the keyboard. Kinda cool trick: The case sides are made of some alloy (looks like magnesium but it too heavy to be so) with a clip-on plastic outer casing. If you pull the plasic casing off the alloy shield on the side closest to the motherboard (NOT the side you unscrew and remove) you will find a large number of signatures, presumably of Sun staff who worked on or near the 386i.